The first results have been released from a major new dark matter survey of the southern skies using ESO’s VLT Survey Telescope (VST) at the Paranal Observatory in Chile. The VST KiDS survey will allow astronomers to make precise measurements of dark matter, the structure of galaxy halos, and the evolution of galaxies and clusters. The first KiDS results show how the characteristics of the observed galaxies are determined by the invisible vast clumps of dark matter surrounding them. Around 85% of the matter in the Universe is dark, and of a type not understood by physicists. Although it doesn’t shine or absorb light, astronomers can detect this dark matter through its effect on stars and galaxies, specifically from its gravitational pull. A major project using ESO’s powerful survey telescopes is now showing more clearly than ever before the relationships between this mysterious dark matter and the shining galaxies that we can observe directly. Supercomputer calculations show how a Universe filled with dark matter will evolve: over time dark matter will clump into a huge cosmic web structure, and galaxies and stars form where gas is sucked into the densest concentrations of dark matter. The project, known as the Kilo-Degree Survey (KiDS), uses imaging from the VLT Survey Telescope and its huge camera, OmegaCAM. Sited at ESO’s Paranal Observatory in Chile, this telescope is dedicated to surveying the night sky in visible light — and it is complemented by the infrared survey telescope VISTA. One of the major goals of the VST is to map out dark matter and to use these maps to understand the mysterious dark energy that is causing our Universe's expansion to accelerate. The best way to work out where the dark matter lies is through gravitational lensing — the distortion of the Universe's fabric by gravity, which deflects the light coming from distant galaxies far beyond the dark matter. By studying this effect it is possible to map out the places where gravity is strongest, and hence where the matter, including dark matter, resides. As part of the first cache of papers, the international KiDS team of researchers, led by Koen Kuijken at the Leiden Observatory in the Netherlands, has used this approach to analyse images of over two million galaxies, typically 5.5 billion light-years away. 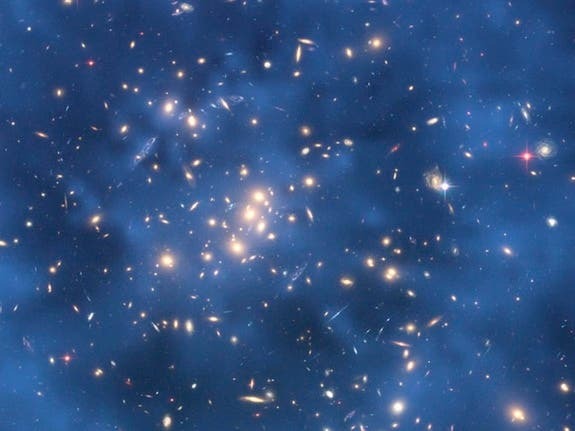 They studied the distortion of light emitted from these galaxies, which bends as it passes massive clumps of dark matter during its journey to Earth. This work made use of the 3D map of galaxy groups, provided by the Galaxy And Mass Assembly project (GAMA), following extensive observations on the Anglo-Australian Telescope. The first results come from only 7% of the final survey area and concentrate on mapping the distribution of dark matter in groups of galaxies. Most galaxies live in groups — including our own Milky Way, which is part of the Local Group — and understanding how much dark matter they contain is a key test of the whole theory of how galaxies form in the cosmic web. From the gravitational lensing effect, these groups turn out to contain around 30 times more dark than visible matter. "Interestingly, the brightest galaxy nearly always sits in the middle of the dark matter clump," says Massimo Viola (Leiden Observatory, the Netherlands) lead author of one of the first KiDS papers. "This prediction of galaxy formation theory, in which galaxies continue to be sucked into groups and pile up in the centre, has never been demonstrated so clearly before by observations," adds Koen Kuijken. The KiDS survey will help to further expand our understanding of dark matter. Being able to explain dark matter and its effects would represent a major breakthrough in physics. The Hubble Space Telescope composite image at the top of the page shows a spectre like "ring" of dark matter in the galaxy cluster Cl 0024+17, evident in the blue map of the cluster's dark matter distribution. The map is superimposed on a Hubble image of the cluster. The ring is one of the strongest pieces of evidence to date for the existence of dark matter, an unknown substance that pervades the universe.